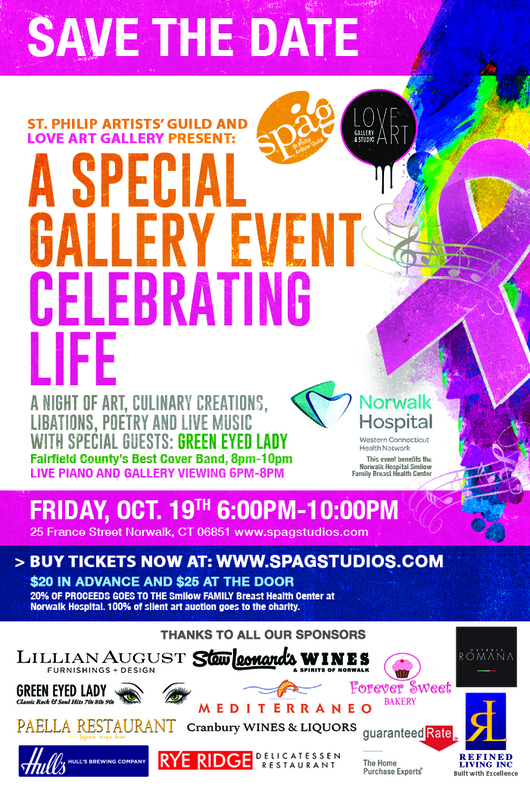 A Night of Art, Culinary Creations, Libations, Poetry and Live Music with Special Guests Green Eyed Lady. The St. Philip Artists' Guild is pleased to host TRANSFORMATION, a new art exhibit featuring current works from their artist members. 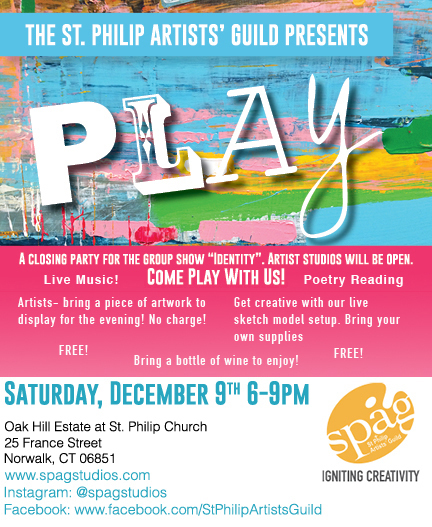 SPAG is pleased to announce CONNECTIONS, an exhibit hosted by the ARTWorks Gallery on the Green, in the Chittim-Howell House on the campus of St. Paul's on the Green in Norwalk. The show runs from February 25 to April 1. A closing party for the group show IDENTITY. Artist studios will be open. Live music, poetry reading, live model. Come play with us! New artwork from the St. Philip Artists' Guild illustrates Harmony and Dissonance; the inherent contrasts in our personal, creative or social worldview that is expressed through our works of art. There will be a second viewing of Harmony and Dissonance on Sunday, from 1:00 - 4:00 pm. Artists' studios will be open. 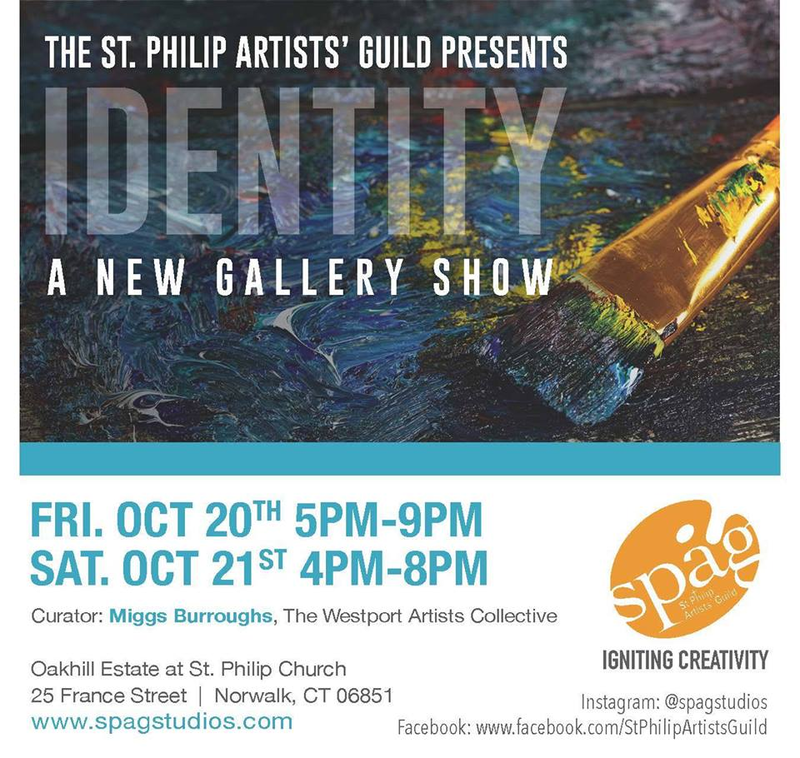 The Norwalk Seaport Association, in collaboration with the St. Philip Artists’ Guild (SPAG) is pleased to announce the conclusion of the 2016 Sheffield Summer Arts Series with an opening reception on Saturday, November 5, from 5:00pm to 8:00pm in the Manice Lockwood Mansion at 25 France Street, Norwalk, CT. The opening will feature works created throughout the summer by members of SPAG and guest artists who participated in the Sheffield Summer Arts Series. This is the fourth year for this event and the artwork’s subject matter have expanded beyond Sheffield Island to include other views of Norwalk Harbor. · An introduction to the artwork of SPAG’s new Associate Members. · A solo show by long-time SPAG artist Amy Bilden. Studios will also be open for a peek at the artists’ works in progress. Open House, a show celebrating the recent growth and artistic diversity of the St. Philip Artists’ Guild (SPAG), will open on Saturday, June 4, 2016 from 5:00-8:00pm, at the historic Manice DeForest Lockwood Mansion, located at 25 France Street, Norwalk, CT. The exhibit will feature works from the 19 SPAG artists while highlighting its most recent members. Artist's studios will be open. Open House celebrates SPAG’s growth achieved through its Associate Member program, where artists can join the Guild without having a studio on the premises. SPAG is very proud to welcome its newest members and to put forth an exhibit featuring such a wide array of artwork.